Schedule an Appointment with a Specialized Children’s Dentist. With 19 locations in the Las Vegas area, we make it easy to find a caring professional your child will love. 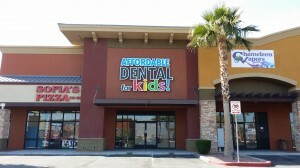 Our offices also include a specialized location called Affordable Dental for Kids in North Las Vegas. All of our dentists and orthodontists are trained to perform dentistry for children with patience and care. If your child is particularly nervous about the dentist, our Affordable Dental For Kids location in North Las Vegas is the perfect solution. With colorful, themed rooms, kid-sized waiting room tables, and treasure chests filled with goodies, kids love going to our dental office. Your child can even watch a movie while they get their teeth cleaned!